pedanticPessimist (Grade: A+) Definitely not to be picked up alone, reading the first book, "A Game of Thrones", is mandatory. While the book definitely features more warfare, combat, and magic than its predecessor, the same definitely goes for political intrigue and shrewd political coups and espionage. Definitely for lovers of cutthroat politics and literal cutthroats. yeahitskonnor (Grade: B+) Second book is better than the first. The family dynamics get crazy and sometimes the multiple story lines get hard to follow. Ultimately it is very entertaining and imaginative. RemusLupin (Grade: B) A solid continuation of the series, but not as remarkable or memorable as some of the other books. KittyFiend (Grade: A+) Favorite book in the series by far. I love all of the politics and especially Tyrion being involved in those politics. I feel this is where the story really starts. Book one was setting up the story, and this is where the story begins. 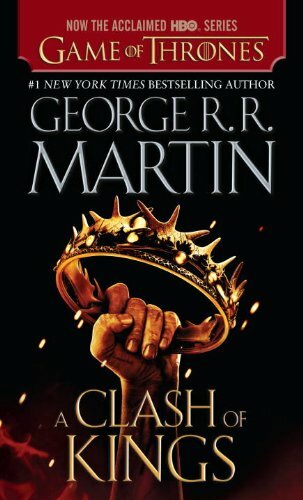 upthescene (Grade: B) I found Clash of Kings to be very slow moving, and so it was hard for me to get through in a reasonable amount of time, which in turn made me even more crazy when I picked it up. Writing was still excellent, as was the story, and it definitely picked up the pace in the last 300 pages or so.